Going for a long drive over the holidays? Want to know where to stop your caravan for the best weather? Interested in taking the convertible or motorcycle out, but want to avoid the rain? Preparing for start in a bicycle race and want to see what gear to pack? Then this is the perfect app for you. TripWeather is an iOS app that makes it possible for you to generate custom weather forecasts for your travelling routes. Specify your route by dropping pins on a map. Select your expected average speed, and TripWeather will calculate your expected route automatically. Drop more pins to indicate a certain route, detour, or extra stops. The weather forecast will be shown to you both i table and graph form, allowing you to experiment with different starting times to find the best weather conditions for your trip. The app is available as a $0.99 download on the AppStore. 99mac reviews essential holiday apps. Fastbikes take a quick look at TripWeather. Longer review by a road cyclist blog. Cycling plus Sweden reviews TripWeather. These screenshot with mark-up roughly show the workflow of the app. The weather along the route can also be viewed as a graph by tilting the phone sideways. The iPad version of course makes use of the larger screen. Nov 28, 2018: TripWeather version 1.5.1 containing a route lookup bug fix is available. Dec 10, 2017: TripWeather version 1.5.0 which drops the credits and is completely free has been released. Nov 30, 2013: TripWeather version 1.3.1 containing minor bugfixes has been released. Nov 28, 2013: Due to the difficulty of maintaining two versions TripWeather Lite has been removed from the AppStore. We are investigating an alternative solution involving in-app purchases. 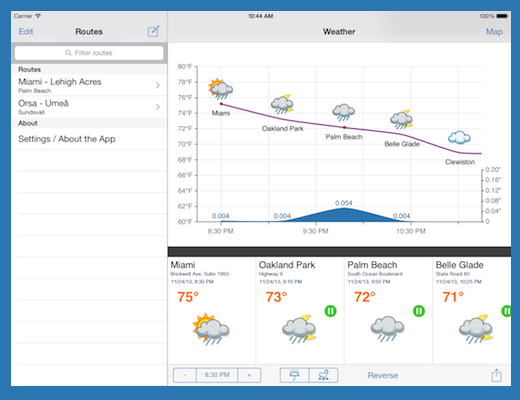 Nov 24, 2013: TripWeather/TripWeather Lite version 1.3 with iOS7 look and feel, Dropbox sharing, easier route creation and a tutorial has been submitted to the AppStore. April 25, 2013: TripWeather version 1.2.2 which fixes the route creation bug is now available at the AppStore. April 20, 2013: The full version of TripWeather has temporarily been removed from the AppStore by us due to an unfortunate bug in the date picker which means that routes might mistakenly be marked as old. We have submitted a fixed version 1.2.2 which should be available shortly. TripWeather Lite remains available at the AppStore. March 6, 2013: Version 1.2 for both versions of the app have been submitted, fixing minor bugs! 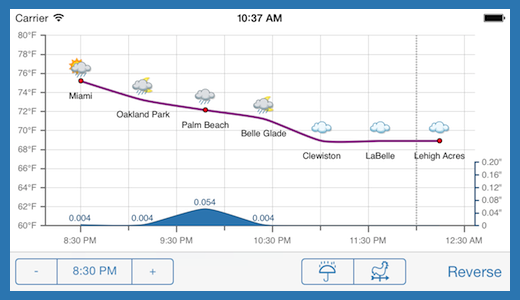 February 21, 2013: We have released a free version of the app, TripWeather Lite. The basic functionality is the same but it has a couple of limitations compared to the full version. Limitations include: only one route at the time, speed is restricted to standard speed, map search is disabled, and route sharing is not available. Apart from that, the app has the same interface and functionality as the full TripWeather. Get it at the AppStore. January 29, 2013: The app will be sold for half price ($1) during February! January 17, 2013: Spanish and Chinese (simplified) versions are now available, version 1.1.2! January 11, 2013: Version 1.1.1 Released and available. Primarily fixes a rare crash-bug. December 22, 2012: Version 1.1 is now available in the AppStore. December 12, 2012: We've just submitted version 1.1 of the app for review and release in most European countries and North America! We have also added a bunch of new languages (see site header). Also, even better news; we now have a native iPad version. The app is universal, which means you only have to pay once to use it on both iPhone and iPad. October 23, 2012: The review was passed without any problems, and TripWeather can now be found on the Appstore! October 14, 2012: The app has been submitted for release in Sweden! Fingers crossed! Will be launched in more countries in the near future. We've created a short YouTube video to show how the app works. It's about 3 minutes long and gives a good overview of the different features and how to use TripWeather. TripWeather is developed in collaboration between Espling IT and LugAB. If you have any comments, suggestions, bug reports or problems, do not hesitate to contact us at tripweather@mackaroni.se.